Eight weeks after the oil rig explosion in the Gulf of Mexico triggered one of the largest environmental catastrophes in the country’s history, attention to the subject hit unprecedented levels in social media last week. While the disaster has consistently garnered major coverage in the American mainstream press over the past two months, it had not been a major subject of interest in blogs or on Twitter. 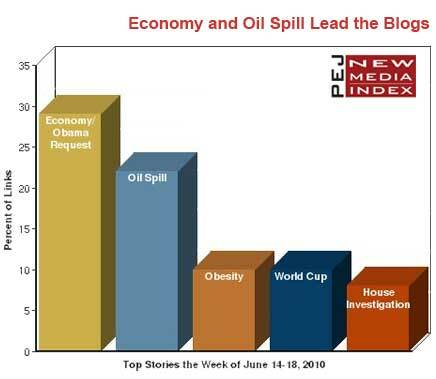 But from June 14-18, 22% of the news links on blogs and 14% on Twitter were about the oil crisis according to New Media Index from the Pew Research Center’s Project for Excellence in Journalism—the highest levels for the story in both platforms. Why did social media interest in the topic spike dramatically last week? It’s not entirely clear, but it was a week in which the oil story clearly became more political and Washington-centric. President Obama delivered an Oval Office speech, BP officials met with Obama, and BP boss Tony Hayward faced a tough grilling on Capitol Hill. Twitter’s most linked-to news stories tended to be more about BP executives, while blogs linked more often to news about the spill itself. In the conversation that ensued, bloggers in particular displayed a significant level of distrust towards both BP and federal officials. Politics also put the economy back in the top seed on blogs (29% percent of the links). Conservative bloggers reacted strongly to President Obama’s urging of Congress to approve nearly $50 billion in emergency aid to state and local governments. Most criticized Obama for wasting taxpayer money. This marks the first time in seven weeks that the economy has ranked among the top five subjects on blogs. The next two topics on blogs, both at 10%, moved well beyond the Washington focus. One was a warning based on 2010 Dietary Guidelines for Americans that obesity is “the single greatest threat to public health in this century.” Another was a BBC report that organizers of the World Cup in South Africa will not ban the plastic horns known as vuvuzelas despite complaints from players and fans. But politics returned at number five, with a report about an investigation of eight House members who held fundraisers with business lobbyists prior to the vote on a Wall Street reform bill. 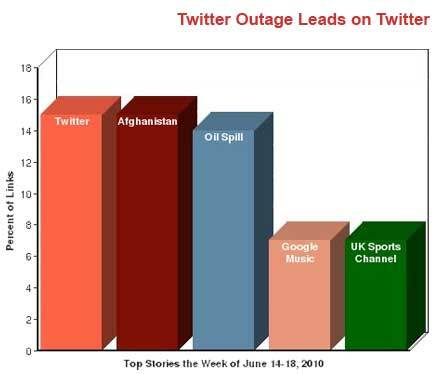 On Twitter, typically known for its focus on technology, the top story (15% of all links) was about Twitter itself—namely a CNET report that a failed upgrade of the site’s software the night of June 14 left the site unusable for many. Just after that (also at 15%) came a story that had not been among the top five Twitter subjects since the week of January 4-8: the war in Afghanistan. Two Afghanistan-related stories generated links from Twitterers including a Fox News report that the U.S. military had issued a nationwide alert for 17 members of the Afghan military that had gone AWOL from an Air Force base in Texas. The other was a Wired story about a contract from the U.S. military with Northrop Grumman to build spy blimps for use in the war. After the oil spill (No 3 at 14%), the No. 4 subject on Twitter was the news that Google might be launching its own music service in the fall (at 7%). Next was a BBC report, also at 7%, that the British 24-hour sports news channel Sky Sports News was becoming a pay-TV channel after eight years of being available for free. On the video-sharing site YouTube, the most-viewed news video was of Rep. Bob Etheridge’s (D-NC) physical confrontation with two unknown men claiming to be students who asked him questions while he walked down the street. The video became a political embarrassment for the Congressman and was viewed almost 2.5 million times last week alone. Bloggers seemed to focus more on the spill itself. Some pointed to the June 15 Washington Post report that the government’s estimate of the size of the spill had risen to as much as 35,000 to 60,000 barrels escaping each day. Others linked to a June 14 investigative report by the Los Angeles Times that some of the malfunctioning equipment at the oil rig was inspected by foreign governments such as the Republic of the Marshall Islands and not the U.S. government. A number of bloggers voiced their distrust of the information they were receiving. Others focused on who was to blame for the situation. “The gulf oil spill tragedy began long before the actual spill…the previous administration did all it could to weaken any governmental oversight, and regulations were written by industry lobbyists and not those who had concern for the environment or those who live in it,” suggested flyin ur eye. Following Obama’s June 15 speech from the Oval Office and the announcement the following day that that BP would pay $20 billion into an escrow account to cover damage claims, the focus turned to the President’s performance. A few conservatives questioned Obama’s motives. “As predicted from day 1, every single one of the environmentalist agenda’s wildest dreams will start being enacted under the guise of the Obama administration’s new-found crisis,” warned Ryan G at Beacon of Truth. Obama’s request for $50 billion in state and local aid to help prevent layoffs of teachers, police, and firefighters was met with enormous skepticism by conservative bloggers. “It doesn’t appear that President Obama has a game plan to help the economy, other than continuing to feed the already-bloated public sector,” added Bill Roberts at Daily Brisk. There were a handful of liberal voices who argued that Obama’s additional request vindicated warnings from some left-wing economists, such as Paul Krugman of the New York Time that the initial stimulus bill passed in 2009 was not large enough to lower unemployment. The most viewed news video on YouTube last week was an embarrassing moment for a member of Congress. Two unknown men claiming to be students asked Rep. Bob Etheridge (D-NC) “Do you fully support the Obama agenda?” as he walked down the street. The Representative then grabbed one of the men and demanded to know their identities. The video was first posted on the conservative website Biggovernment.com and became a widely-disseminated embarrassment for Etheridge in a short period of time. He later issued an apology for his behavior. Meanwhile, the identities of the men who filmed the video are still not known.